We finished our afternoon service by 7pm and DH decided to make our goodbyes as fast as possible to make it to Robinsons' Metro East. He planned to drop by National Bookstore to shop for the kids' school things. He thought that it would be harder to shop in the coming days because almost people are all shopping for school necessities so the most crammed store for this season are the bookstores. We were able to secure a cab in just 5 minutes and as we travel along the road we saw some people in the gasoline station aiming some shots upwards in the sky. With plain curiosity in my heart to those people I looked at the sky laughing at the people's eccentricity and I saw a very rare sight for about 1-2 minutes. I saw a crescent moon with a star above it resembling a little bit of a smiley form. I regret the fact that I didn't have my digicam with me and anyway I don't think I can get a nice shot with it. 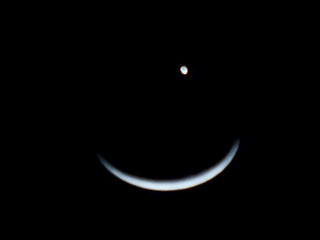 Well the most important thing was we all saw the rare beautiful sight of the smiling moon and Venus (I learned from the news after that it was Venus). We shopped and upon reaching our home we searched for any news about what we had recently seen in the sky. It was past 7pm then and I saw the news and this picture in gmanews.tv I was happy to see that rare sight in our TV news confirming our theories that it's indeed a rare sight. Now with every rare sight or phenomenon we see I know that it's a sign for some good or bad things that will happen. Hope it's good.